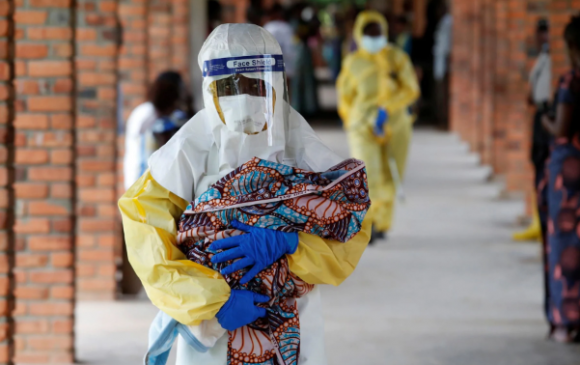 The deadly Ebola Virus Disease (EVD) in the Democratic Republic of Congo (DRC) recently saw a spike in the number of cases reported. As of this report, over 800 cases have been of EVD have now been identified. The difficulty in combating the disease this time, in contrast to the 2014 outbreak, has been the ability of health care workers to penetrate a region that is immersed in violent conflict. The conflict regions, including North Kivu and Ituri, have made the episode more challenging than previous epidemic outbreaks. Sadly roughly 30% of the victims this time have been children, and women have been disproportionately affected, accounting for over 60% of cases identified. There are four potential vaccines currently being studied to fight the disease, but it is important to remember these are all experimental. The most promising vaccine, rVSV-ZEBOV, a vaccine developed by Merck, and has been administered to over 76,000 people. In an abundance of caution, neighboring countries including South Sudan have begun vaccinating health workers and front-line responders. Whether a vaccine is truly effective is an open question, as safety data is still being evaluated. A recent panel discussion sponsored by Doctors Without Borders / Medecins san Frontieres (MSF), emphasizes the bedrock value of “trust” among the local community as one of the most critical conditions needing support in order to eradicate this disease. Bolstering trust toward the foreign response in a conflict ravaged territory and trust toward recovering victims who have joined the healthcare team are essential. At the same time, MSF is making progress against the disease by implementing several newer innovations. Progress in the treatment of EVD include employing more local survivors within the health care setting. Immunity allows survivors to attend to the needs of patients for a longer time period than those who lack previous exposure. That survivors are a part of the community allow for the reduction of anxiety and psychosocial suffering associated with the disease progression. Those who have contracted the disease benefit from the shared experiences of many of the healthcare workers. Another innovation is the implementation of using plexiglass, a basic technology comprised of a transparent piece of plastic, in addition to the standard plastic sheeting, to help workers and families safely interact with patients in the centers. The treatment centers have also been upgraded with private toilets and showers, which helps again to respect the dignity of the patients; and to reduce the threat of contamination. Building the local staff to maintain the operation will be critical in further disease prevention, when international teams need to go home. Keeping the community informed and educated is critical to dispelling the various rumors and disinformation that can spread when a disease outbreak occurs. For instance, according to MSF physician Dr. Brian D’Cruz in their panel discussion, during the recent election in the DRC, a rumor swirled around the community that the thermometers, or thermoflash devices, (which detect body temperature through the ear) – were causing people to change their minds about who to vote for. This made the healthcare works targets of threats and violence. Employing more local survivors in the fight against the Ebola virus will help to spread truthful information among the populace. So trust is a critical value that needs to be supported by the new ruling government. Regardless of the hopeful nature of a potential vaccine, and the progress at the treatment centers, public health professionals have called for the outbreak to be recognized as an international health emergency. International health officials should indeed be alarmed that the largest single day increase in reported cases of EVD in the DRC very recently.